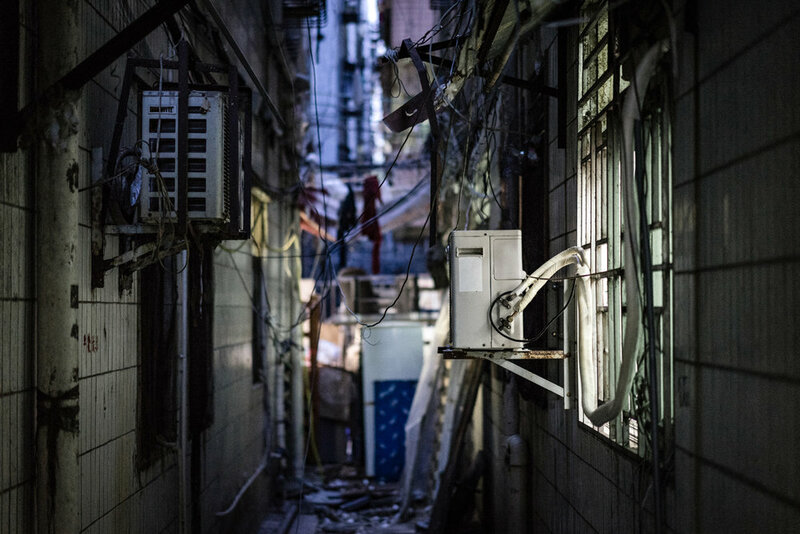 This collaboration between sound-studies scholar Naomi Waltham-Smith and photographer Alessandro Zanoni examines the spaces, forms of life, and soundscapes that have been lost or are threatened by urban redevelopment in Shanghai and Shenzhen. 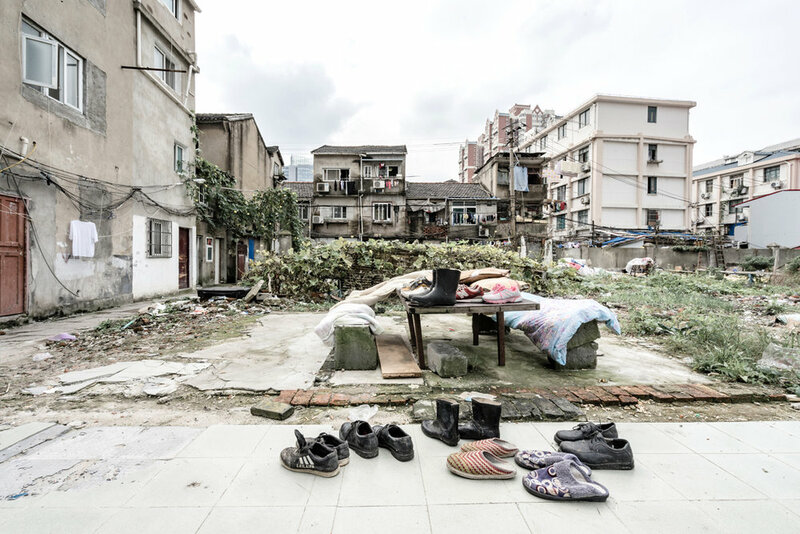 As a result of China’s rapid urbanization, rural villages have been absorbed into the fabric of many large Chinese cities and transformed into urban villages that provide affordable housing for migrant workers. They represent a particular morphology—a high-density, mixed-use, pedestrian-friendly exception to car-dominated urbanisms in China—and with it a form of the commons that is being eroded through wholesale demolition, the imposition of an homogenous grid, and the displacement of migrant workers to make room for commercial spaces and luxury apartments. While these villages and the threat of their erasure has captured the imagination journalists, urban designers, and scholars in recent years, what is novel about this project is the significance it gives to sound as a technology of memory. This project attempts to capture the sense of loss and the fragility of these autonomous spaces that provide refuge for the precariat and that shelter an experience of the commons eroded by neoliberal modes of subjectivation. The project presents a series of paired photographs and “sonic stills”—snapshots, each of precisely one minute duration—drawn from a periods of intensive fieldwork in a number of urban villages. In a critical repurposing of practices of montage, bricolage, and flânerie—the juxtaposition of sound and image presents an urban spectrality—a lost city and communal form of life that haunts capitalist processes of creative destruction. Inspired by the empty peripheria of postwar Italian cinema, Zanoni’s photographs exemplify a practice of urban landscape photography that contrasts with the typical photojournalistic depiction of global urban precarity. Many of the photos are shot during the middle of the day so that the evenness and hue of the light increases the sense of alienation. The desaturated tones resonate with the vestiges of abandoned lives and unpopulated or scarcely populated scenes, and yet an often subtly humorous or whimsical tone nonetheless turns away from the tragic or nostalgic character that typifies much photography of urban ruins. Moreover, the sonic stills are paired with the images in such a way that the coupling is often uneasy, surprising, or ironic. The sonic snapshots capture the dynamic, energetic interactions that characterize the coexistence of the urban villagers and their use of public space. As such, they offer a promise to animate the desolate spaces of the images. Echoes of a life lost or fading into extinction, the soundscapes haunt the empty spaces, but the incommensurability of the media—the refusal of two stills to resolve into moving image and the contradictory temporality that each invokes—ensures that they never quite fulfill the promise of presence. As such, the sonic stills testify to a form of survival that outlives the rapacity of capitalist destruction. And yet the ephemerality and finitude of the sonic contaminates this possibility. In this way, this multimedia project—as a collection of visual and audio documents—also reflects on the state of the archive. Not simply a nostalgic immunization against lost and an exercise of memory, the archive itself, as Jacques Derrida has observed, is a space traversed by conserving and destructive impulses. The sonic spectrality that haunts the images points to the fact that every archive is constituted around a secret—by a repressed that returns like a revenant. On the one hand, the soundscapes are witnesses—alibis even—for those precarized and marginalized under neoliberalisms. On the other hand, they reveal the aporetic logic of testimony: those who survive cannot bear witness to the experience of those who do not. We tend to think that sound dies out all too quickly, but this project indulges in an Orphic fantasy of a sonorous existence that outlives its sources. The lively soundscapes that testify to the dynamism and pleasures of a shared communal life have seemingly survived too long or have arrived too late: the voices and bodies that produce these sounds have already evacuated these urban spaces. The pairings of image and sound here, though, ensure that there is no sentimental nostalgia for lost presence. What we have here, rather, are what Walter Benjamin called “dialectical images” in which the sonorous past becomes audible only in the flash of the camera’s present. The relations between sound and image are allegorical, the temporalities disjointed. In this way, the field recordings brings to a standstill the ruin’s dialectic of melancholia and fetishism. This project invites us, in listening to the lives of the precarious, to ponder what it means politically and ethically for our listening to survive their survival. Along with other aspects of of Waltham-Smith's work, these field recordings suggest that listening can be a political praxis with the capacity to disturb the fetishistic logic of capital. A collection of sounds and images will be presented in an online exhibition by the Slought Foundation. This project was undertaken with the support of the Mellon Humanities+Urbanism+Design Initiative and the Penn Undergraduate Urban Research Colloquium. I am also grateful for the generous assistance of Mary Ann O’Donnell and Penn undergraduate Adam Shapiro. Baishizhou village, Shenzhen (2016). Photo by Alessandro Zanoni. Guangfuli neighbourhood, Shanghai (2016). Photo by Alessandro Zanoni.